Author Talk & Book Signing With Randy Lippincott at Central City Public Library May 4 at 1:00pm! Author Talk & Book Signing with Randy Lippincott, on Sat, May 4 @ 1:00pm. Lippincott is the author of three books. 🛩🏔️He was born and raised on a farm, nine miles north of Central City, NE. 5th Grade Students From Central City Middle School Visited CC Public Library’s Makerspace! Congratulations to Our Blind Date With a Book Prize Winners! Sheree Stahn, Kathy Ritta, Cheyenne Veach, and Cejay Mieth!! Thanks so much to everyone that participated! Thanks so much to everyone that participated! A HUGE THANK-YOU goes out to Prairie Creek Vineyards & Winery, Taco John’s, and Central City Dairy Queen Chill & Grill for providing prizes for our drawing!! According to the “Rate Your Date” slips, most of the “dates” with the books were enjoyed by the participants. Blind Date With a Book at Central City Public Library! Our very popular BLIND DATE WITH A BOOK begins today and goes through the entire month of February!!! With each “Rate Your Date” slip you return, adults are entered in a DRAWING TO WIN: dessert and a bottle of wine from Prairie Creek Vineyards & Winery and $50 in Bison Bucks! TEENS MAY ENTER TO WIN a $20 Amazon.com gift card and $10 gift cards from Taco John’sand Central City Dairy Queen Chill & Grill. Drawing slips must be returned by March 4, 2019! Blind Date With a Book Returns to Central City Public Library the Entire Month of February! Back by popular demand (for the ENTIRE MONTH OF FEBRUARY)…. Check Out Our Current Library Newsletter Here! Enter Crazy Christmas Sweater Contest at Central City Public Library by 12/27/18! Celebrate the 50th Anniversary of the Apollo 8 Mission to the Moon Via Live Webcast at CC Public Library! Experience a a guided recreation of the voyage along the actual path, synchronized with the astronauts’ spoken words. Featured Presenter: Dr. Carter Emmart. Dr. Emmart is the Director of Astrovisualization at the American Museum of Natural History. We will be offering a viewing of the webcast in our library meeting room (on our 65″, Ultra HD television) to anyone that would like to watch it). This webcast is brought to you by the American Museum of Natural History and the STAR Library Network’s NASA @ My Library program. 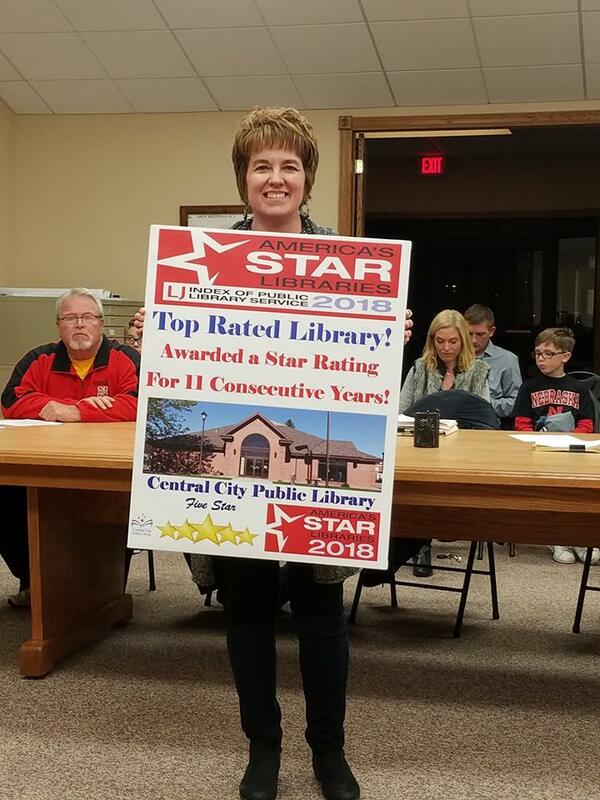 City of Central City Congratulates CC Public Library On Our 5 Star Library Award! Congratulations to Sara Lee and her staff for another rare 5 star library award! We’re proud of our outstanding library and staff! Stop In Today and Enjoy Some Pumpkin Muffins and Coffee!